The writer left home very early in the morning of 16 December, 2017, to arrive at the Golden Gate National Cemetery, in San Bruno and be there by 08:15 hrs. The weather was clear, sunny and very windy. 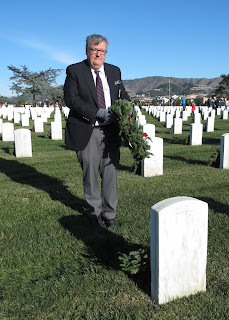 Many more people than last year attended the event, and 8,000 wreaths were placed on the tombs of the fallen soldiers. From Senior Squadron 188, Oakland Airport, Lt Col Tinnirello, Maj Fridell, Maj Brown, Capt Hayes, Capt Stevulak and SM Jones participated in this year’s ceremony. In addition, members of the East Bay Cadet Squadron 18, based in Hayward, attended. Silicon Valley Chapter Sons of the American Revolution. The musical prelude was provided by the Stuart Highlanders Pipe Band, and they set the mood for the event. 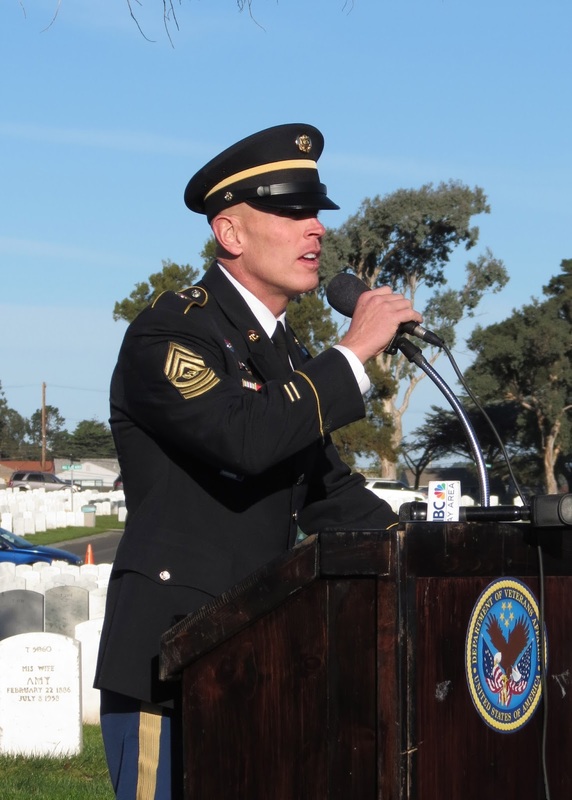 The Master of Ceremonies was Kevin Graves, Founder & President of Some Gave All – The Joy Graves Foundation. Commander Sergeant Major Blaine Houston. 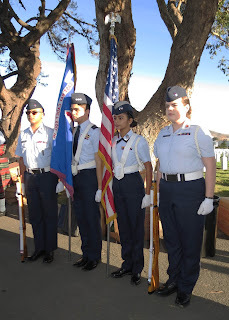 The presentation of the colors followed, conducted by the Civil Air Patrol East Bay Cadet Squadron 18’s Color Guard, and accompanied by the Silicon Valley Chapter of the Sons of the American Revolution. Afterwards, the National Anthem was sung by Regina Gonnella, from the Avenue of Flags Committee. The Pledge of Allegiance was led by Kristen Matthias from the San Andreas Lake Chapter, District 6 Director, Daughters of the American Revolution. At exactly 9:00 AM Pacific Time, a moment of silence was called to remember all fallen American soldiers. 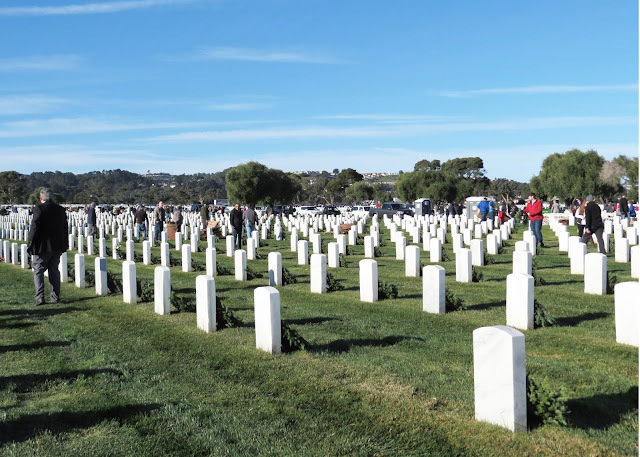 The time was the same for ceremonies occurring simultaneously across national cemeteries throughout the country. a wreath on a tomb. There was an invocation by Father Tony Vallecillo, from St. Robert’s Catholic Church. 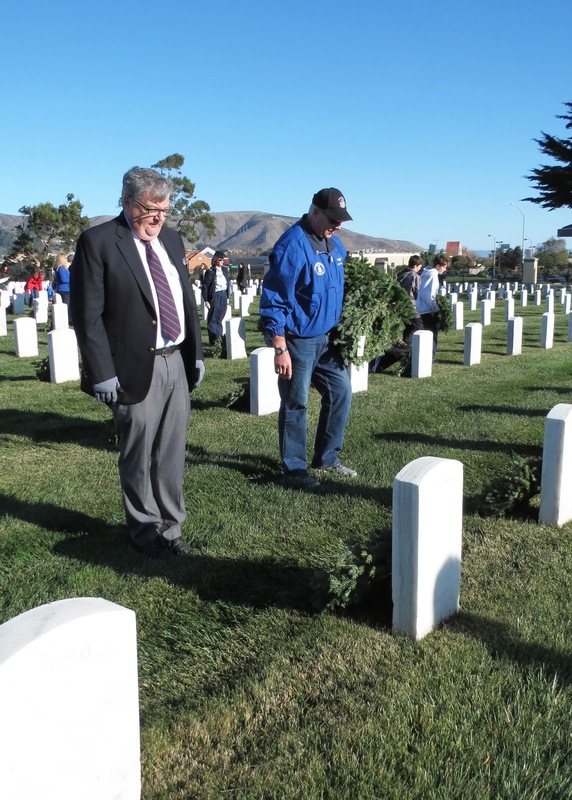 After the opening remarks, representatives of the U.S. Armed Forces as well as the Merchant Marines and POW/MIA placed wreaths in designated spots close by. The Keynote Speaker was Command Sergeant Major Blaine Houston from Camp Parks, Reserve Forces Training Area. After the closing remarks by Kevin Graves, everyone was instructed in how to place the wreaths in the sections determined for this year. in a minute of silence. Taps was played by Frank Dorritie, from Bugles Across America. Everybody proceeded to pick up wreaths from the many cardboard boxes and place them in front of the tombstones. 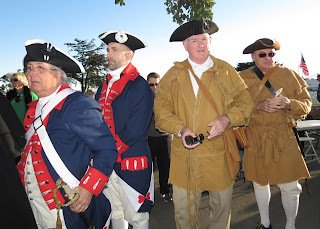 It was a moving ceremony that in my opinion helped to teach younger generations not to forget about all the people that preceded us and made such a sacrifice to keep America free. 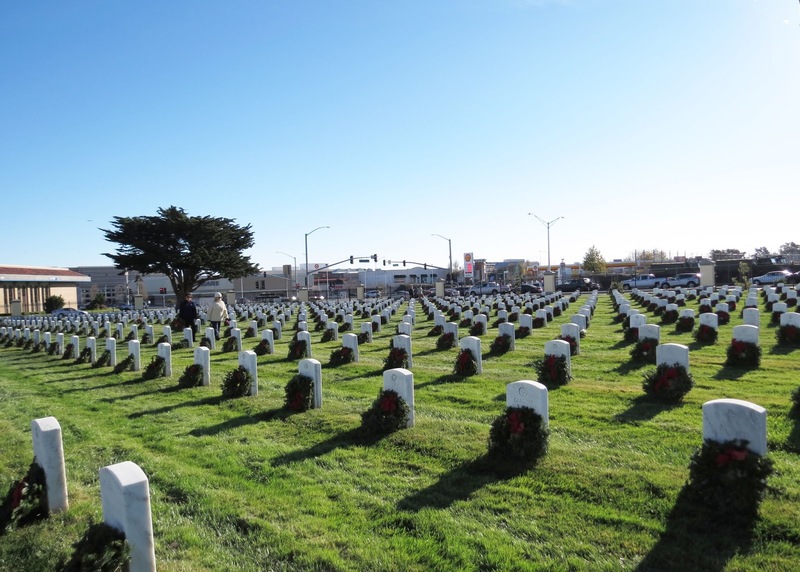 A small section with people placing wreaths. 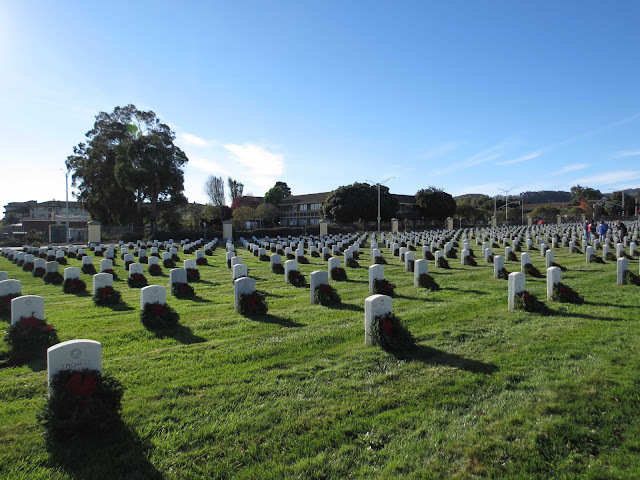 A small section with wreaths. 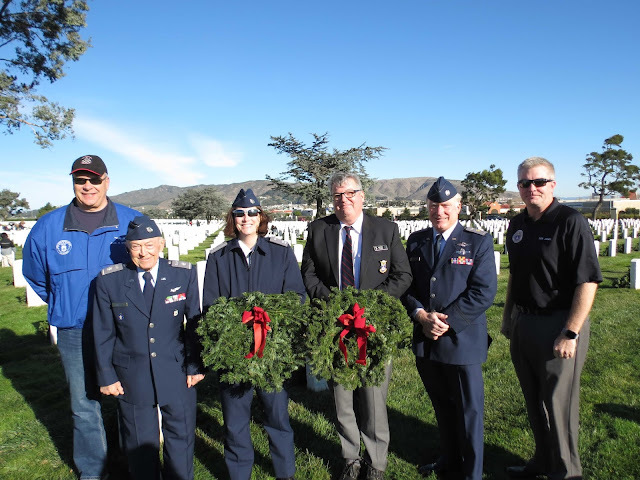 (L) to (R) Capt Stevulak, Lt Col Tinnirello, Maj Brown, Capt Hayes, Maj Fridell, SM Jones. Another small section with wreaths.